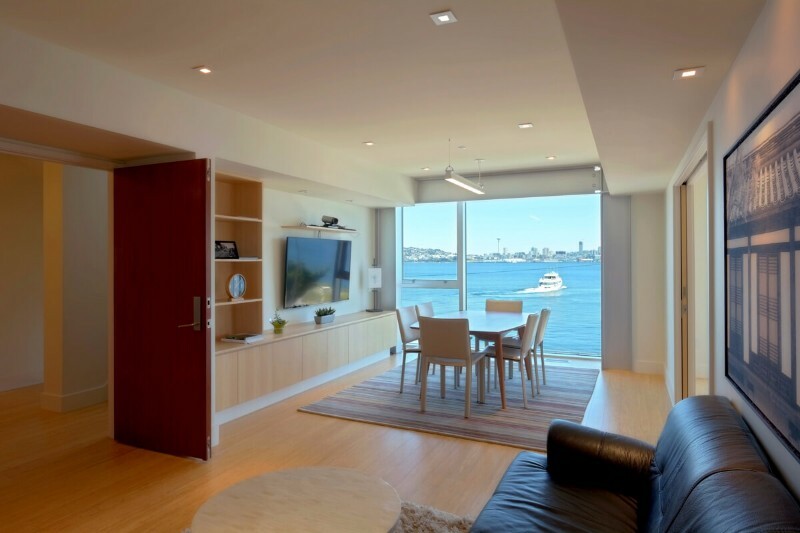 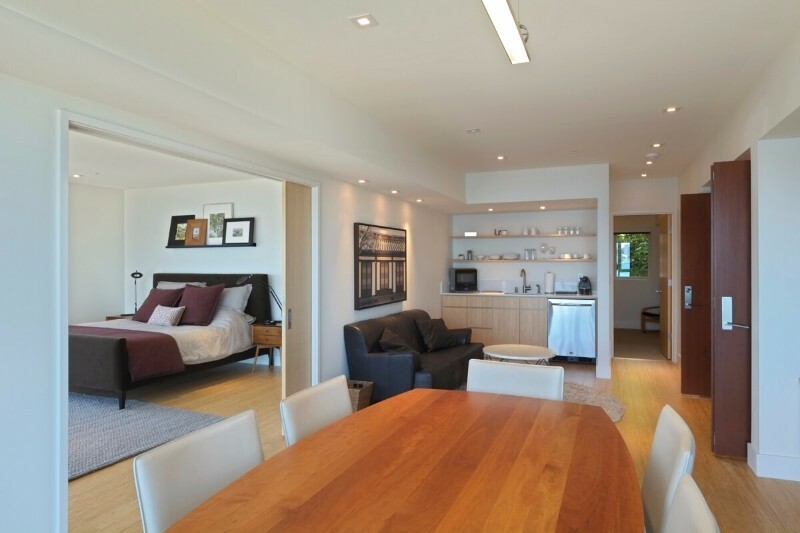 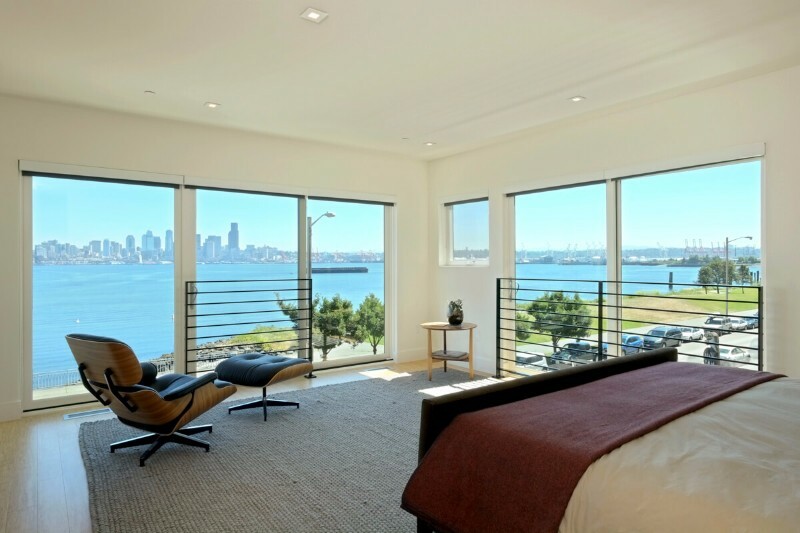 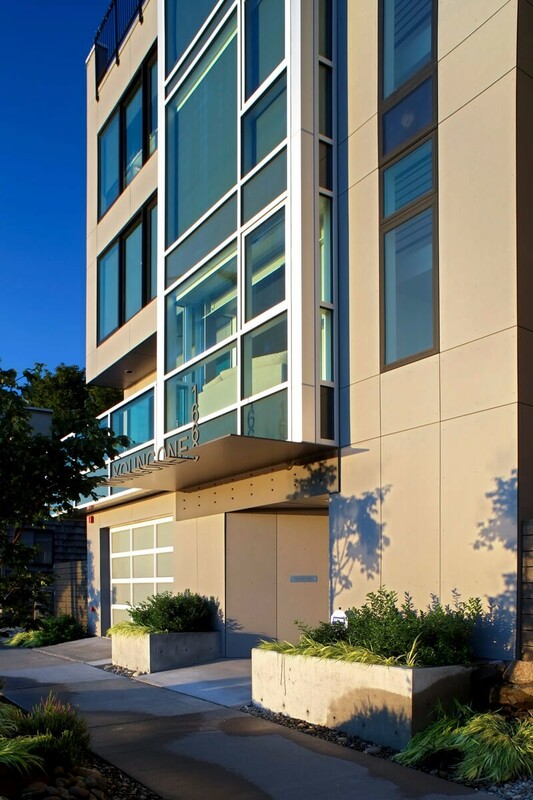 1663 Harbor Avenue is a tall residence built on the foundations of an existing building in West Seattle, Washington. 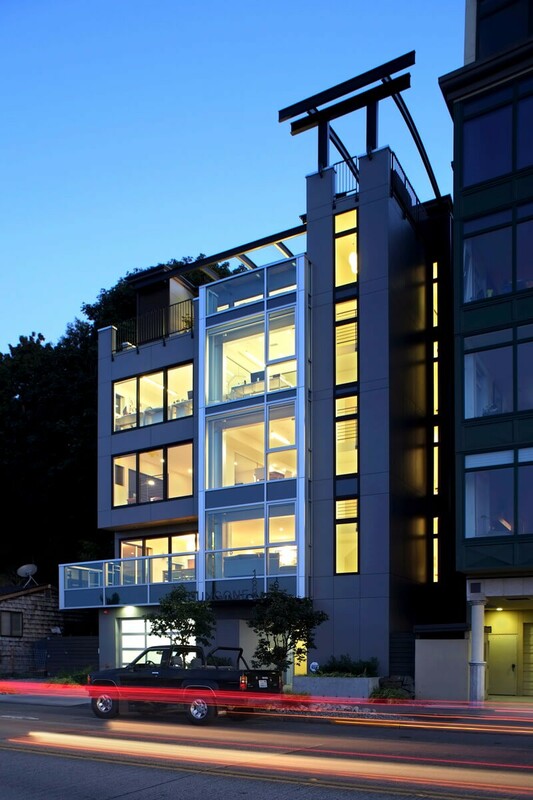 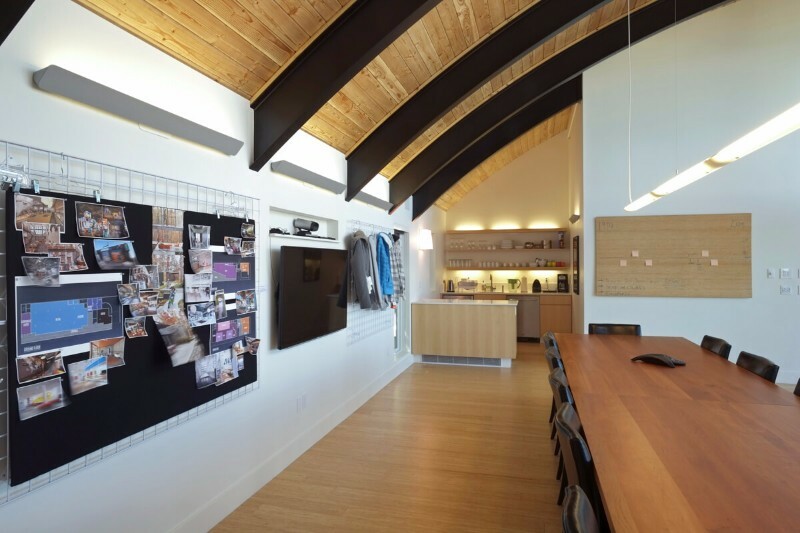 The building was commissioned by a Korean client for use as living, residential, light work, and meeting space. 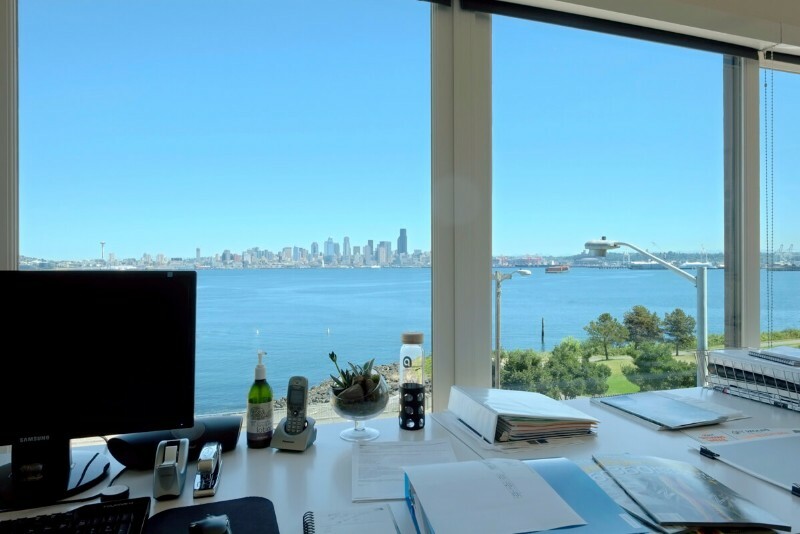 The 3-story 1980’s era building that Rhodes Architecture + Light started with was outdated and leaking but it was also sited across Elliott Bay from the City of Seattle, enjoying a panoramic view of the Emerald City itself. 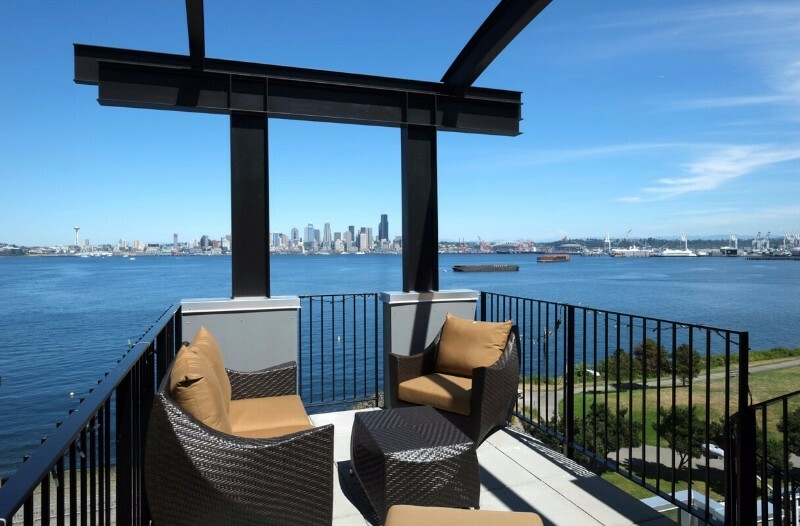 The building site is just across an avenue from a vibrant waterfront including public beaches, an extensive walking/biking trail, docks for fishing and a water taxi service to downtown Seattle. 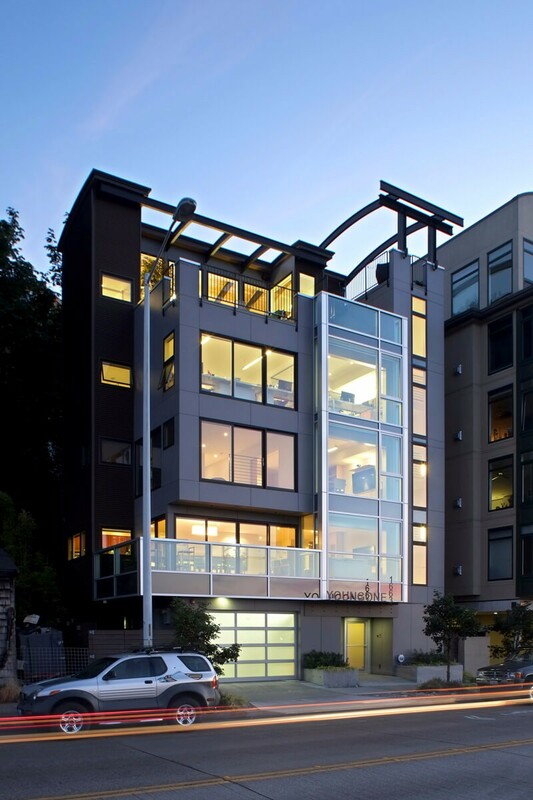 The zoning of the site allowed a tall residence (over 65 feet high and six stories) and mixed-use space. 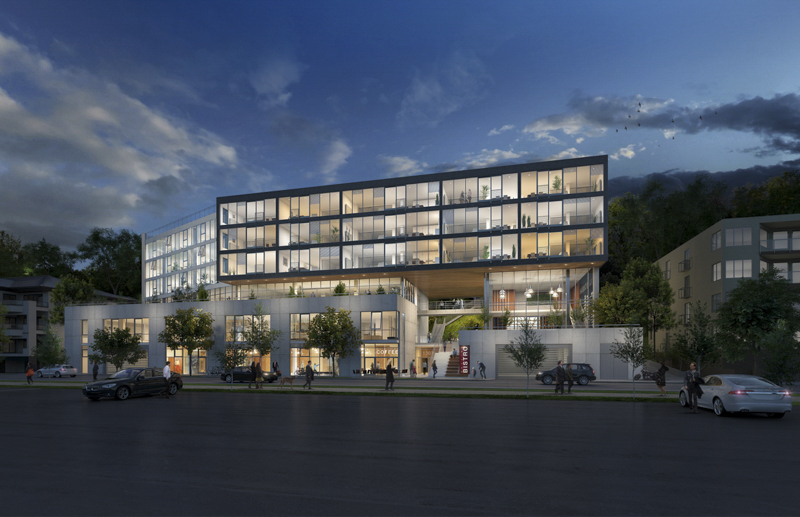 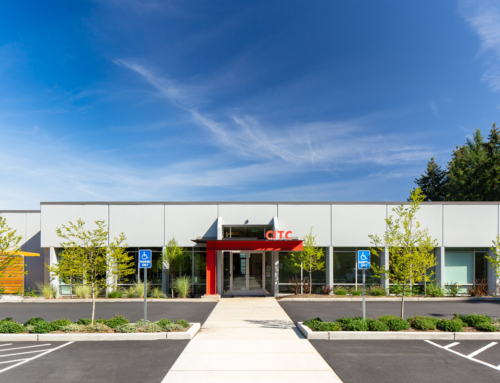 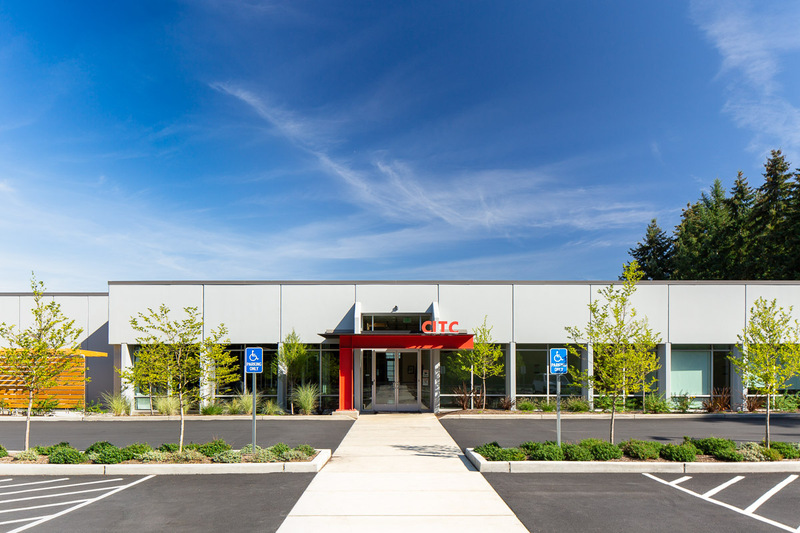 The building height required the design to include a commercial elevator, fire sprinkler systems and to meet both commercial and residential building codes. 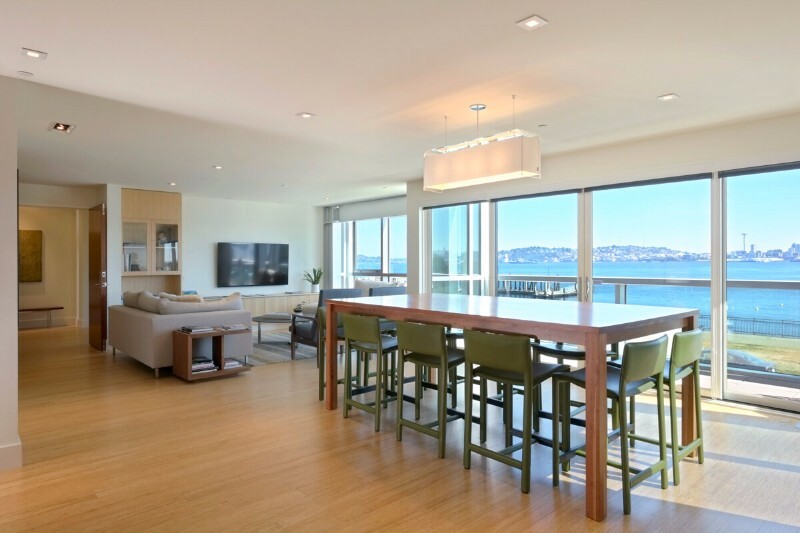 The land included shoreline and steep slope environmentally critical areas and the existing building sat on 25-year old concrete pilings in liquefaction-prone soils. 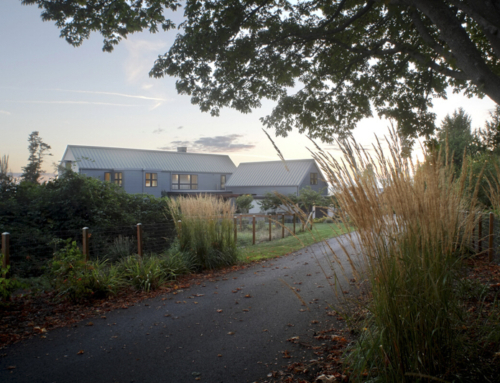 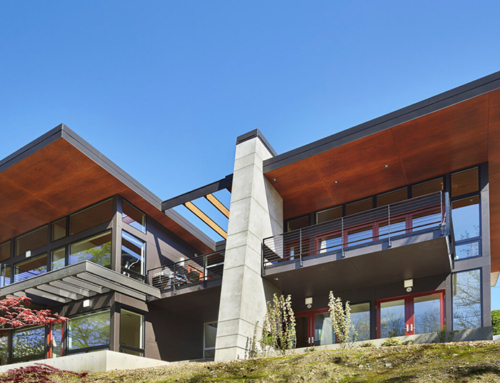 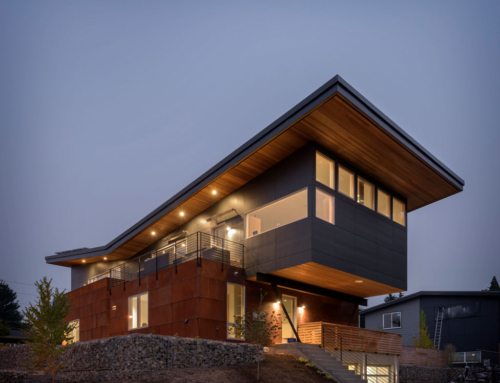 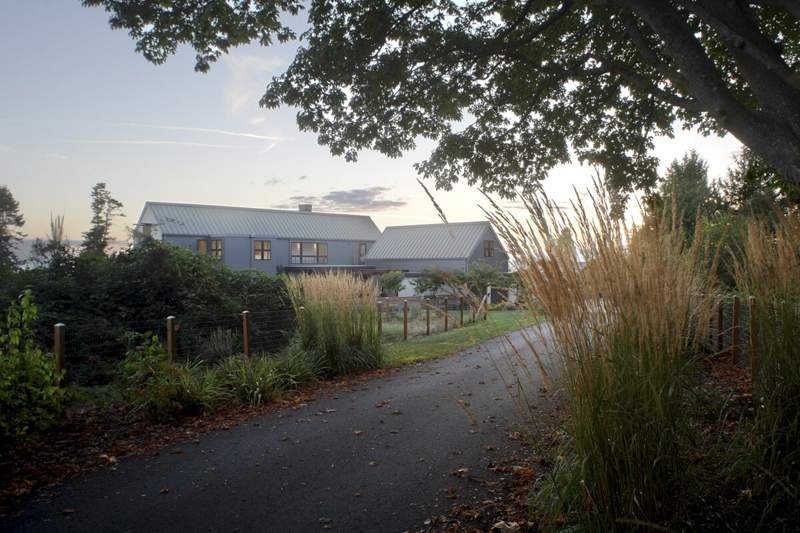 Utilizing the land, with it’s steep slopes, poor soils, shoreline regulations, and very limited access was a challenge for Rhodes Architecture + Light and E+H Construction, the builder. 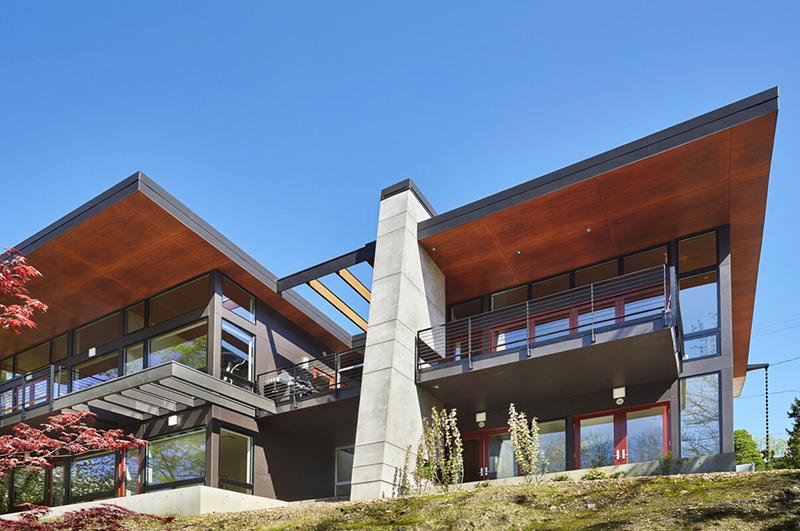 Rhodes Architecture + Light’s client wanted at least four bedrooms, a master bedroom suite, three and a half baths, a full kitchen and dining areas as well as kitchenettes and large and small meeting spaces. 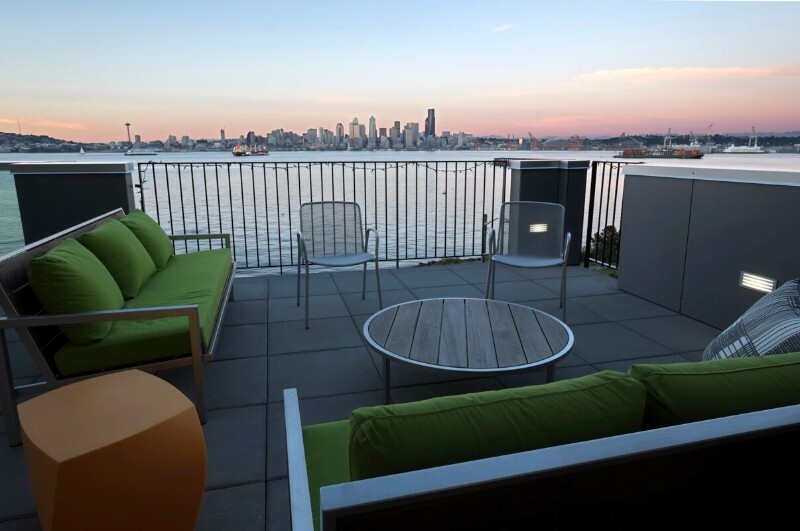 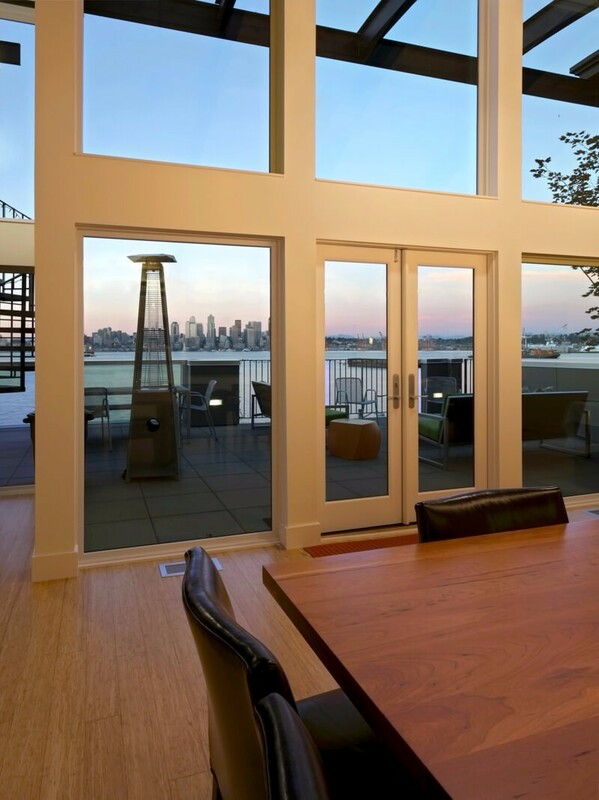 Two levels of large roof decks take advantage of the amazing eastern view of Seattle. 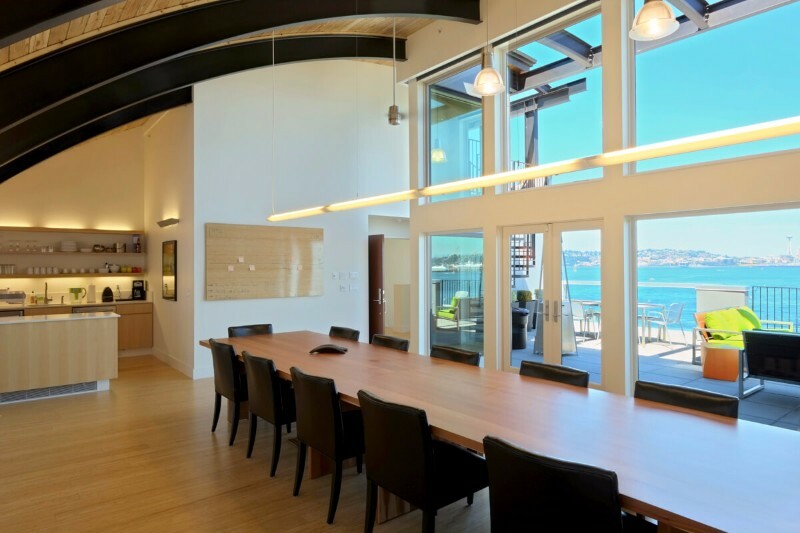 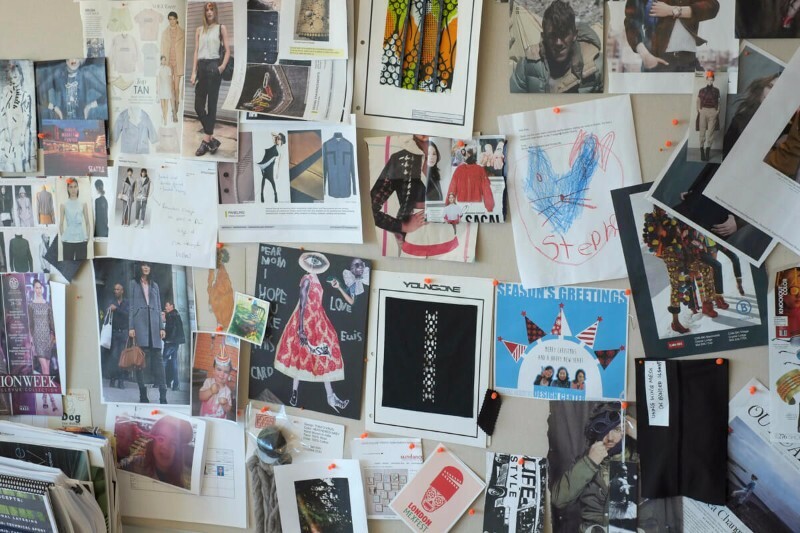 A commercial elevator, extensive audio/video/conference systems, and a four-car garage also share over 6,000 square feet on six levels. 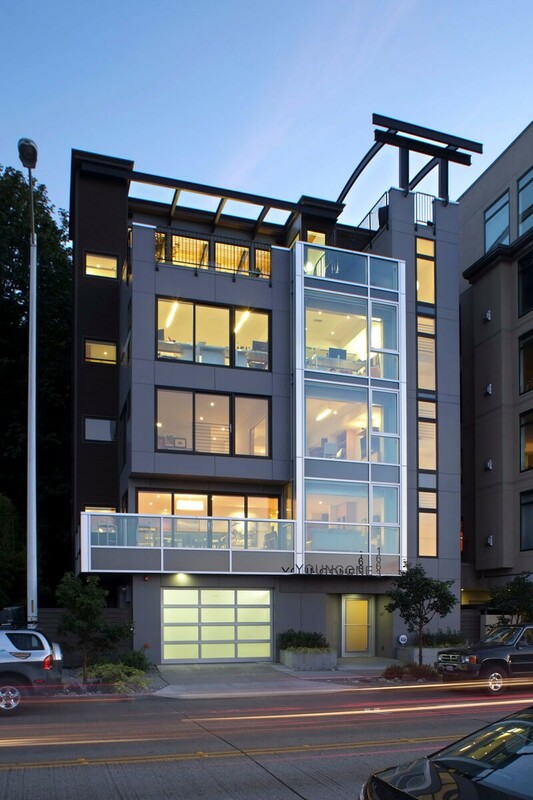 The aesthetic design started with the basic footprint of the existing building extended to four additional stories. 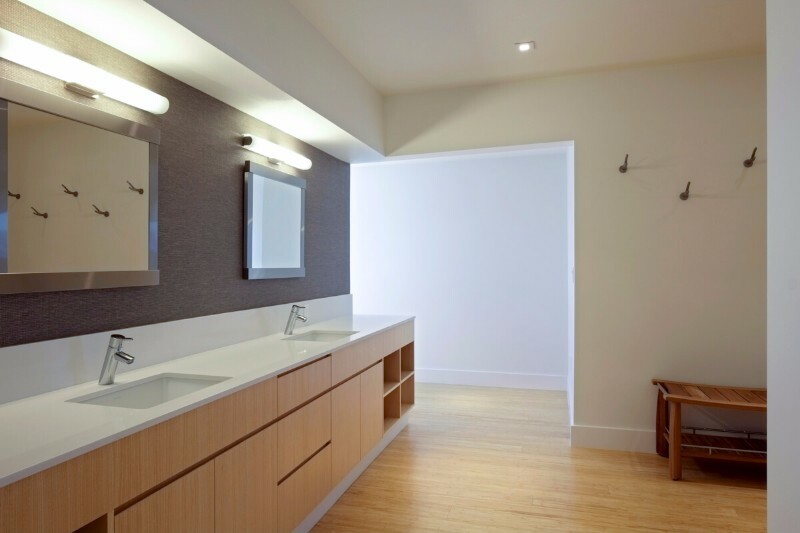 Simple, clean materials with minimal maintenance requirements were important inside and out. 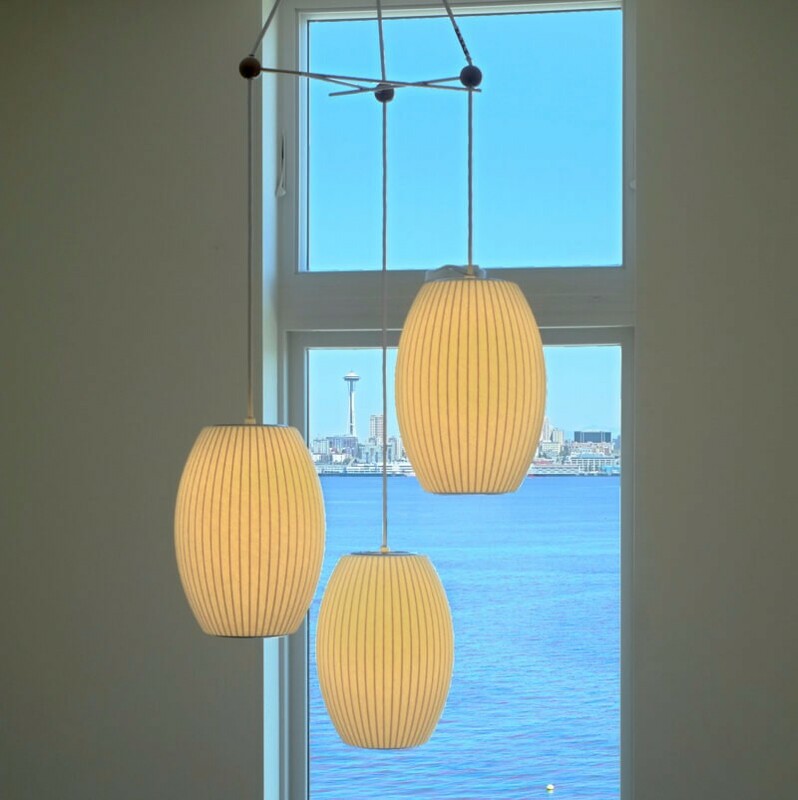 The owner asked for a building that felt like a Northwest home while taking advantage of extensive glass and natural light, as well as the busy waterfront and the commercial avenue on which it is located. 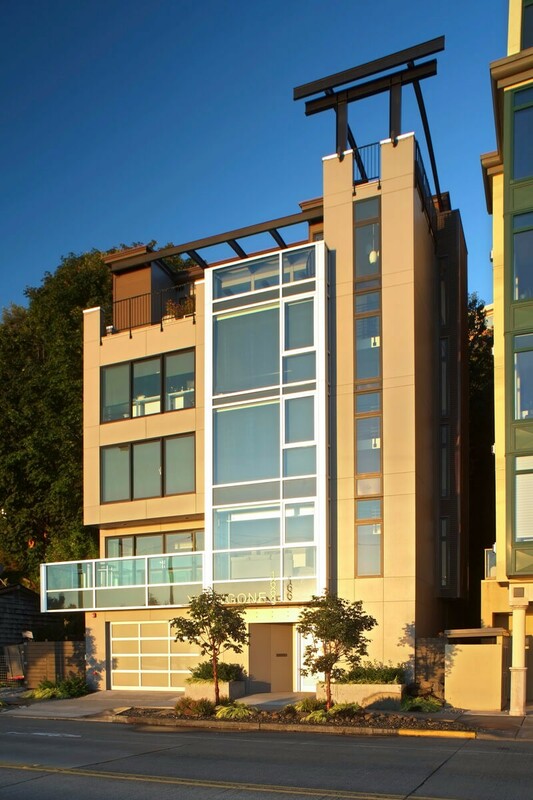 A five story curtain wall of green glass and a steel structural frame allow breath-taking views of the city across the bay and lend a signature material to the building, drawing the viewer’s eye upward. 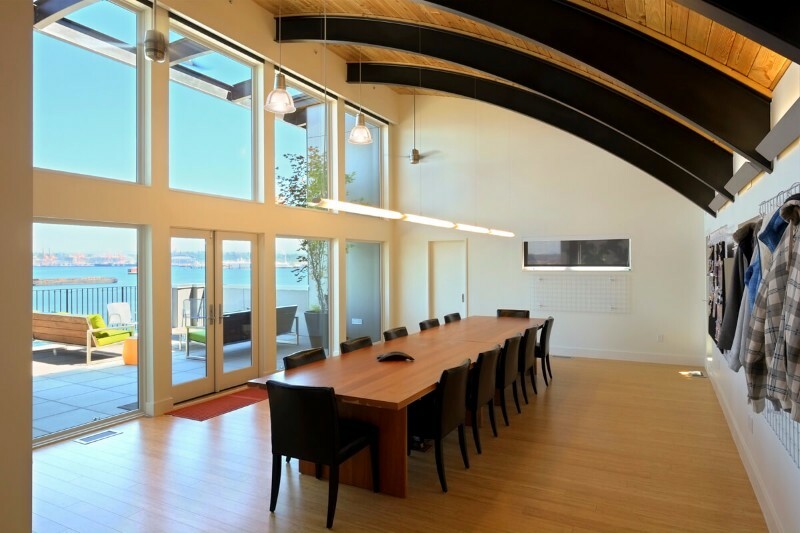 Curved steel beams and heavy timber roofs convey the curves of the marine environment just steps away while giving a significant form to the top of the building and the meeting and deck spaces enclosed. 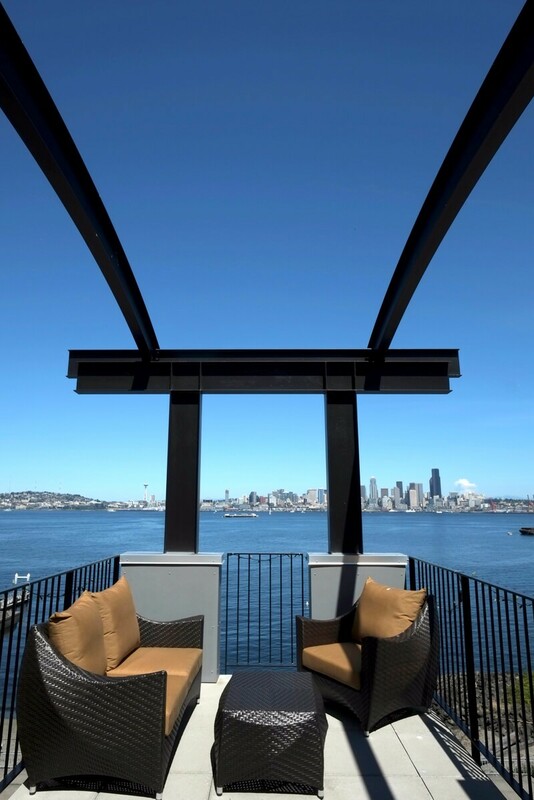 A steel “torii” beam and column structure at the top roof deck suggests a gateway, a portal to the east and the wider world, reflecting the owner’s heritage. 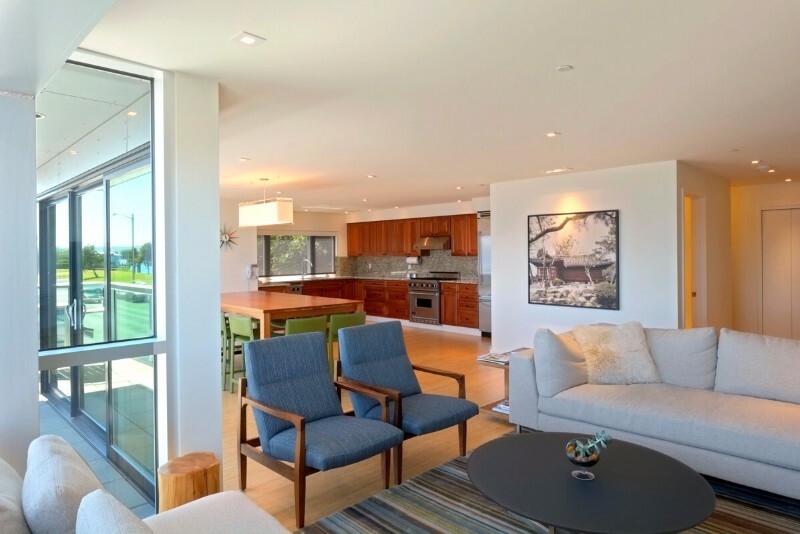 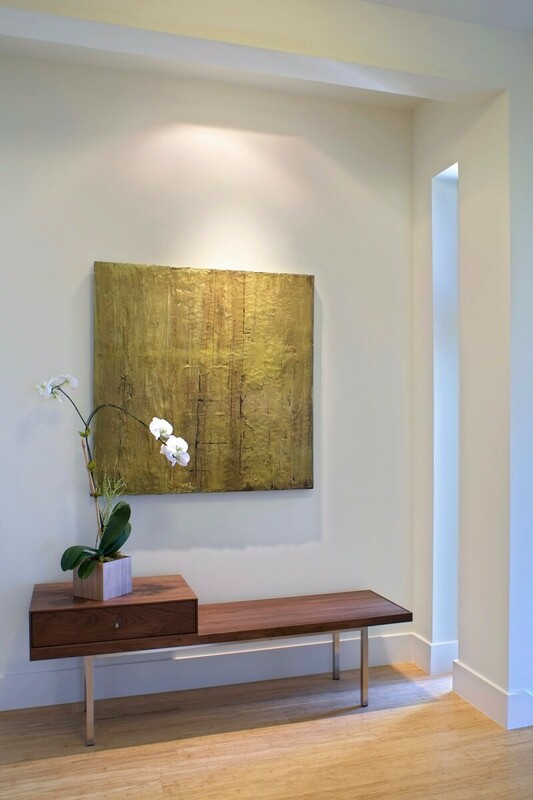 Interiors of bamboo flooring, light quarter-sawn oak cabinetry and doors, grass cloth, simple modern tile, trim, and fixtures reflect the clean, contemporary lighting. 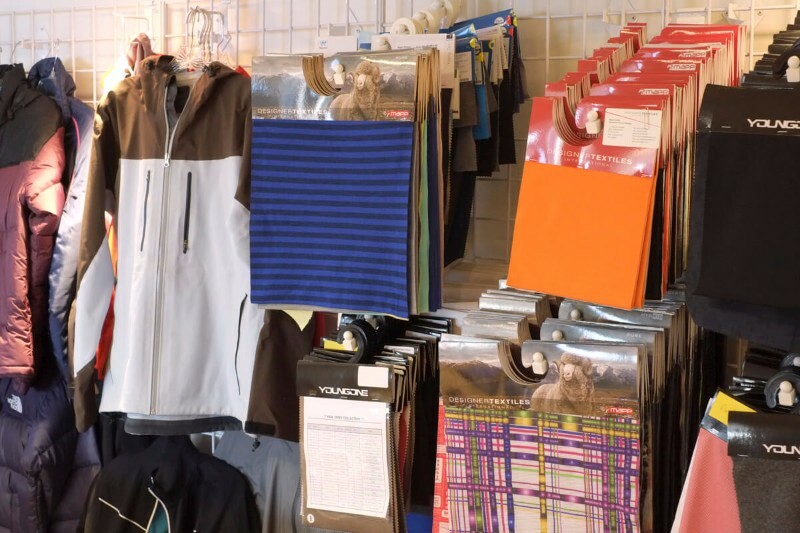 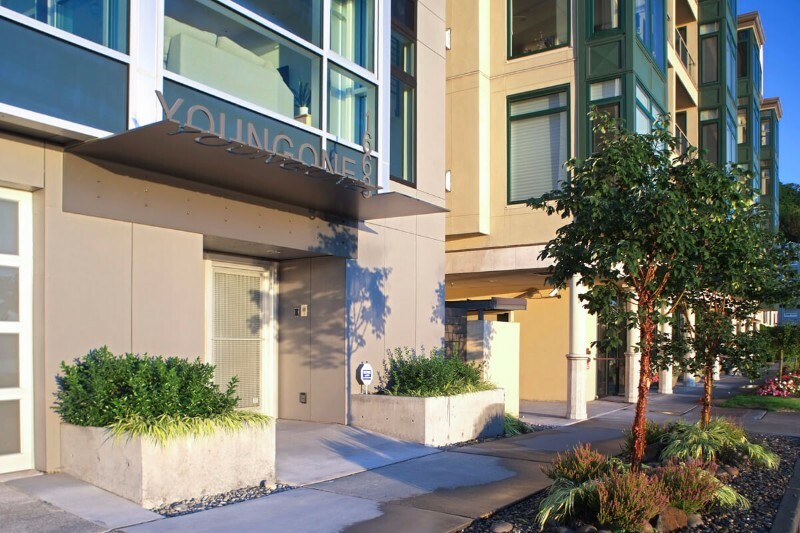 The Youngone building was built within a tight 14-month schedule and, with owner-added fixtures, electronic, and low-voltage systems, within a tight construction budget. 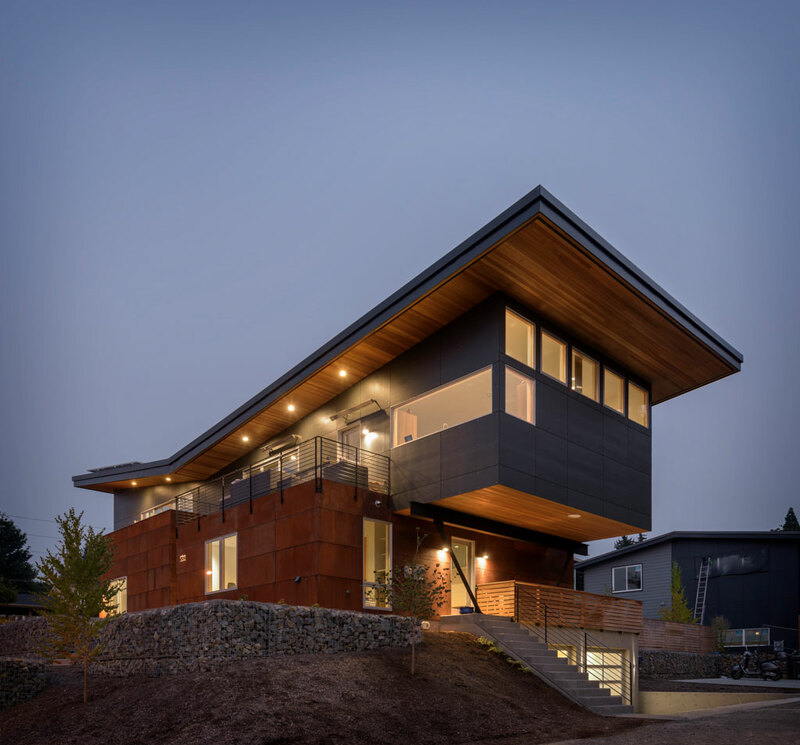 The finished building is a collaboration between Rhodes Architecture + Light, E+H Construction, Swenson Say Faget, Structural Engineering, LightWire, Two.9 Design, and Lee McMaster, Landscape Architect.